For the beach in Cyprus, see Ayia Napa § Beaches. Makronisos (Greek: Μακρόνησος, lit. 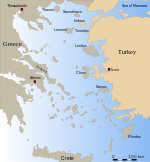 Long Island), or Makronisi, is an island in the Aegean sea, in Greece, notorious as the site of a political prison from the 1940s to the 1970s. It is located close to the coast of Attica, facing the port of Lavrio. The island has an elongated shape, 13 km (8 mi) north to south, around 500 m (1,640 ft) east to west, and its terrain is arid and rocky. It is the largest uninhabited Greek island. It is part of the Kea-Kythnos regional unit and in the municipality of Kea. In ancient times the island was called Helena (Ancient Greek: Ἑλένη), and was situated so as to protect the harbours of Thoricus and Sunium. It was also called Macris (Μάκρις), from its length. Strabo describes it as 60 stadia in length; but its real length is seven geographical miles (12 km). It was uninhabited in antiquity, as it is at the present day; and it was probably only used then for the pasture of cattle. Both Strabo and Pausanias derive its name from Helen of Troy, the wife of Menelaus: the latter writer supposes that it was so called because Helen landed here after the capture of Troy; but Strabo identifies it with the Homeric Cranae, to which Paris fled with Helen, and supposes that its name was hence changed into Helena. There cannot, however, be any doubt that the Homeric Cranaë was opposite Gythium in Laconia. The Kea Channel between Makronisos and neighbouring Kea was the site of the sinking, in 1916, of HMHS Britannic, sister ship of the RMS Titanic. Makronisos was used as a military prison island from the time of the Greek Civil War until the restoration of democracy, following the collapse of the Regime of the Colonels in 1974. Because of its history, it is considered as a monument of the civil war era; therefore the island and the original structures on it are protected from alteration. Among the prisoners of Makronisos were Apostolos Santas, Nikos Koundouros, Mikis Theodorakis, Leonidas Kyrkos and Thanasis Vengos. Le Nouveau Parthénon (1975) by Kostas Chronopoulos and Giogos Chryssovitsianos. Happy Day (1976) by Pantelís Voúlgaris. Makronissos (2008), by Ilias Giannakakis and Evi Karabatsou. ^ Stephanus of Byzantium. Ethnica. s.v. Ἑλένη. ^ Strabo. Geographica. ix. p.399. Page numbers refer to those of Isaac Casaubon's edition. ^ Strabo. Geographica. ix. p.399, x. p. 485. Page numbers refer to those of Isaac Casaubon's edition. ^ Pliny. Naturalis Historia. 4.12.20. Hamilakis, Yannis, "The Other 'Parthenon': Antiquity and National Memory at Makronisos", Journal of Modern Greek Studies 20:2 (October 2002), pp. 307–338. This article incorporates text from a publication now in the public domain: Smith, William, ed. (1854–1857). "Helena". Dictionary of Greek and Roman Geography. London: John Murray.